All great film careers must start somewhere, and with 1984’s Blood Simple, we find the debut of the Coen brothers. Directed and written by siblings Joel and Ethan, the film takes us to Texas. Bar owner Julian Marty (Dan Hedaya) suspects his wife Abby (Frances McDormand) is cheating on him - and he’s right. As proven by private detective Loren Visser (M. Emmet Walsh), she’s having a fling with Ray (John Getz), one of Marty’s employees. This displeases Marty, of course, and he decides to do something about it: he offers Visser $10,000 to kill the pair. A mercenary sort, Visser agrees. From there we follow intrigue and a mix of complications. Dating back to their second film – 1987’s Raising Arizona - I’ve gone through a long, complicated history with the Coen brothers. I never saw Simple during its original era, so Arizonawas my first experience with their work. It got lots of hype as a wacky, original comedy – and I thought it was terrible. My opinion of the brothers improved considerably with the rich, intense Miller’s Crossing in 1990 but dipped again with the erratic Barton Fink the next year. And so it’s gone since then; for me, the Coens have alternated relative hits with moderate misses. I looked forward to Simple because I thought it played into the Coen genre that I’ve liked the best: dark drama. It’s their comedies that flop for me, but when they’ve been more serious, the Coens have delivered their best work. A whole lot of people think Simple is a terrific movie, but unfortunately, I can’t quite figure what leads them to this impression. I don’t think it’s a bad flick, but it seems flawed in many ways. On the positive side, the flick does look great. The Coens weren’t the only later-to-be-notable filmmakers involved with Simple, as cinematographer Barry Sonnenfeld made his feature debut here. He gave the movie a strong sense of style that belies its “first flick” origins and its budget. This isn’t a movie that ever looks like something from newly-minted aspiring professionals. And the cast manages to add a sheen of class and quality to the product as well. McDormand also made her feature debut here but she shows the depth and self-assurance we’d learn to expect from her. I could live without Getz’s “Sling Blade Before Sling Blade Existed” vocal mannerisms, but overall, the actors make the movie seem like something from more seasoned filmmakers. So what goes wrong? To me, the biggest problem stems from the script. Simple gets a lot of the tone and minutiae of film noir without much of interest around which to build these components. Simple starts slowly and never really manages to kick into a higher gear. I’m sure if I looked, I could find a more uneventful murder movie, but I can’t think of one right now. I recognize that the Coens weren’t aiming for high drama and pyrotechnics. I recognize that they wanted something more introspective and thought provoking. I recognize that much of Simple deals with the aftermath of murder and the guilt/emotions that come along for the ride. Unfortunately, they just weren’t mature enough as filmmakers to explore this territory in an interesting way. Perhaps if the Coens remade Blood Simple now, they might be able to develop its story and characters in a more satisfying manner. In the early 80s, however, they bit off more than they could chew, and they made a moderately intriguing but often slow and uncompelling movie. Note that the Blu-ray gives us the 1999 Director’s Cut of the film. Unlike most alternate versions, it runs a few minutes shorter than the theatrical edition. As far as I can tell, the original has never appeared on DVD or Blu-ray. Blood Simple appears in an aspect ratio of approximately 1.85:1 on this Blu-Ray Disc. Despite drawbacks related to the source, this was a mostly appealing presentation. Sharpness tended to vary. Some shots offered very nice clarity, and those were more frequent than not. However, more than a few soft elements appeared. Most of these seemed to stem from the source photography; Simple wasn’t exactly a big-budget affair, so inconsistencies became more expected. The majority of the flick offered pretty good definition. Colors were adequate. The movie went with a fairly deep palette that favored dense tones, and these looked positive; they displayed nice clarity and never became too heavy. Blacks were a bit inky but usually fine, and shadows seemed smooth. Print flaws failed to appear, and I saw no edge haloes or signs of noise reduction. As mentioned earlier, the image lacked great clarity due to the limitations of the original photography, but the Blu-ray represented the movie about as well as I could expect. I believe Blood Simple came with a monaural soundtrack back in 1984, but it got an upgrade for the 1999 Director’s Cut. That’s what we hear via the Blu-ray’s DTS-HD MA 5.1 audio. Even with the changes that occurred in technology and standards over the intervening 15 years, the mix for Simple remained… well, pretty simple. Music offered stereo imaging that seemed fine, and effects broadened to the sides in a moderate manner. These delivered basic panning and involvement but nothing especially involving or active. Surround usage added a little pep to the proceedings, though still in a fairly limited manner. Driving scenes mustered a little action, and a few other elements cropped up in the back speakers. Most of the material stayed in the front, though, so don’t expect much from the surrounds. Audio quality varied but was usually fine. Speech tended to be the most erratic, largely due to some weak dubbing on occasion. Lines were always intelligible and usually appeared reasonably natural, but they could come across as stiff and forced at times. Music seemed fairly rich and full, and effects were pretty solid. I suspect that was the part of the movie that enjoyed most of the re—recording benefits, especially related to the loud, booming gunshots. All of this came across as a fairly satisfying mix given the movie’s age and budget. How did the 2016 Criterion release compare to the original 2011 Blu-ray? The 2016 disc expanded the prior Blu-ray’s 2.0 mix to 5.1, and it managed to deliver greater involvement, as it used the back speakers better than its predecessor. The track still showed its limitations, but the 5.1 version seemed a bit stronger. Visuals also reflected the restrictions of the source material but still managed improvements. The Criterion Blu-ray was cleaner and better defined than the 2011 disc. This wasn’t a night and day difference, but the Criterion definitely looked better. The Criterion release offers mostly new extras, and under “Filmmakers”, we find two segments. 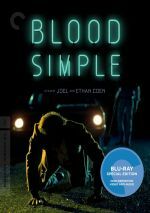 Shooting Blood Simple runs one hour, 10 minutes, 29 seconds and presents a chat with writers/directors Joel and Ethan Coen and cinematographer Barry Sonnenfeld. Shot in 2016, this offers a kind of “selected-scene” commentary that adds visuals via the use of a telestrator. Does that side of things bring anything useful to the package? Not really. The telestrator manages to make a few items slightly more obvious but the piece works fine as an audio-only affair. Note that the participants do take creative measures here, as they sometimes “rewind” or freeze the movie to make a point – this still doesn’t seem visually-expressive, though. During “Shooting”, we learn about photography, sets and locations, cast and performances, influences, budgetary restrictions and issues related to inexperience. That final area gives the commentary some zing, as it’s fun to hear these now-famous/established filmmakers talk about their cinematic growing pains. Cinematography dominates “Shooting” because Sonnenfeld dominates “Shooting”. A veteran of the audio commentary format, he seems more at ease and chatty than the Coens, so he talks a lot more than they do. Which is fine, though this means “Shooting” heavily emphasizes his line of work. I like the notes we get about photography – Sonnenfeld and the Coens deliver many insights – but I wish “Shooting” covered other topics in greater depth. It’s a worthwhile piece if cinematography interests you but it’s less engaging otherwise. Billed as A Conversation with Dave Eggers, we find a 2016 interview with Joel and Ethan Coen. It goes for 35 minutes as Eggers chats with the Coens about the film’s origins and development, the “fund-raising trailer” and money challenges, influences, story/character areas, the Texas setting, cast and performances, release and reception. Inevitably, some of the “Conversation” repeats from “Shooting”, but it still comes with a lot of new information. The Coens prove to be open and loquacious as they give us entertaining thoughts about the flick and its place in their careers. Two interviews appear under “Actors”. Also from 2016, we find discussions with Frances McDormand (25:05) and M. Emmet Walsh (16:33). In these clips, we learn about their careers, their work on Simple and their interactions with the Coens. Both chats work well, though I think McDormand’s offers the richer vein of information. Because she continues to work with the Coens – and has been married to Joel for decades – she provides a deeper view of the brothers as a whole, and she gives us tons of useful material. Walsh also provides a lot of good notes, though he focuses more on Simple than anything else. Nonetheless, he boasts a slew of fun stories and offers a consistently engaging chat. Both interviews entertain and inform. Sound and Music goes for 23 minutes, 44 seconds and presents a 2016 piece with composer Carter Burwell and sound editor Skip Lievsay. As expected, they talk about the movie’s music and audio as well as their partnership and related areas. They offer nice insights about their work in this likable, substantial conversation. In addition to three trailers, we get a booklet. It provides an essay from novelist/film critic Nathaniel Rich. While not one of Criterion’s best booklets, it brings a little value to the set. The Criterion release loses an audio commentary from the prior Blu-ray. Normally I’d bemoan this omission, but the track on the 2011 disc offered a joke piece with no actual movie-making facts attached. It was mildly entertaining and best and not something I miss. On some levels, Blood Simple represents a strong first statement from the Coen brothers. On others, however, it suffers from a lack of cinematic development and falters. The Blu-ray comes with representative picture and audio as well as an informative set of supplements. Simple doesn’t soar as a movie, but this disc brings it home well.